Save the date! Please click on Downloads over on the left of this page for a team application or to purchase balls. Lots of prizes and 100% of the profits go right back in to YOUR community! BEER, BEER, BEER. What a great setting!! What a great turnout!! What a great party!! Many thanks go out to Xanthi, the Pint Fest committee, and all the great volunteers that helped make the Second Annual Penitentiary Pint Fest a great event. The weather was great, the band was rocking and the beer was flowing. A fantastic crowd made for a great event. What better way to cap off a fantastic year. I am so proud to help lead this group and give back to the community in the manner that we do. The Rotary Club of Fort Yuma does a great job providing some fun and exciting events for this community that help to give back like we did at Carver Elementary and at OC Johnson this year. We provided more than 30 kids with back to school clothing, we helped many kids with special living circumstances at Christmas with a shopping event. 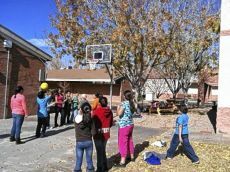 Fort Yuma sent 11 kids to RYLA to help them learn leadership skills. Our scholarship committee is hard at work sifting through the many applications, and we hope to award about $8,000 in scholarship money. We have supported many other non-profits already and plan to give out more of the money we worked so hard at raising to help the community where we live. 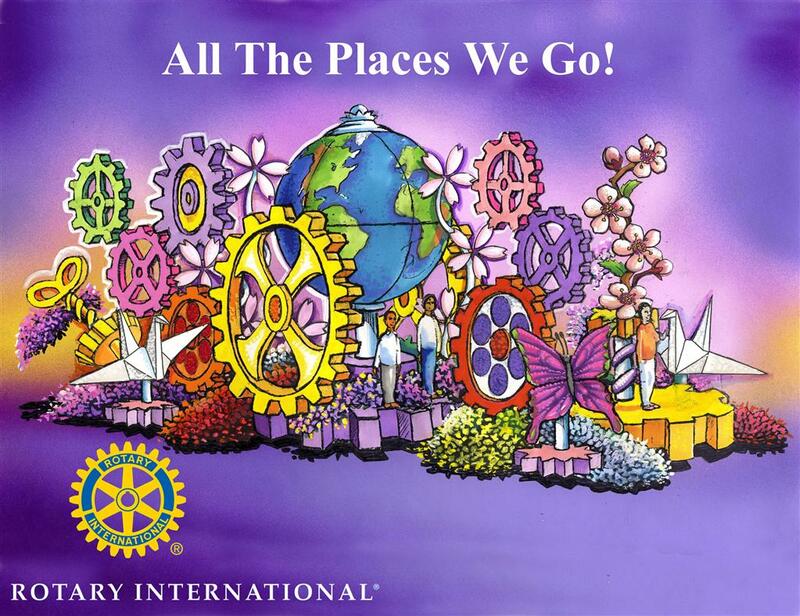 We only have a few things left before the 2014-2015 Rotary year comes to an end. On April 30th we will be having a social at the Elks Lodge at 5:30pm. We will be dark on that day as it is the 5th Thursday of the month, but please join us for a a drink or two and some appetizers that evening. Then the only thing other than the weekly meetings left is THE TRIP TO NOWHERE. Our annual awards and installation dinner is like no other. We will all meet at Lutes Casino on June 12th at 5:30pm and then go somewhere, but who knows where. Our club is a great combination of people that really know how to make things happen. Whether it is fund-raising, service projects, social activities or just a regular meeting we continue to support the idea that we ARE the FUN club. Thanks to everyone for making it a great year. The Rotary Club of Fort Yuma can throw one heck of a party. Congratulations to Annette Lagunas and her committee for putting on another successful Mardis Gras on Main Block Party. In recent history, this has been our biggest fundraiser every year and helps to provide for such projects as Carver Elementary School, provides scholarships and send our community youth to RYLA, a leadership camp in January put on by the district level of Rotary. Our club has such a diversity of members from the community that we like to try and capitalize on for their expertise and know-how to accomplish some of the things we do at Fort Yuma. The club has a couple of more events this year with some beer serving events to help raise some extra funds and our 2nd annual Penitentiary Pints Fest. We will be serving beer at MATO this weekend and at the Music on Main event on March 28th downtown. 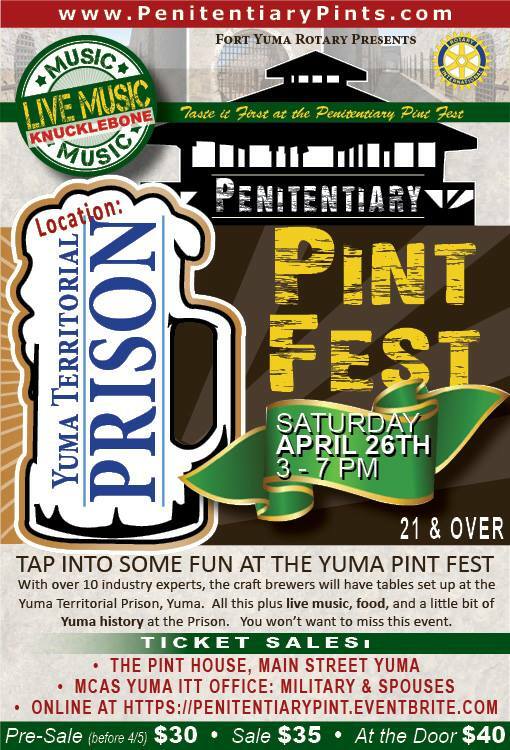 The Pint Fest will be held on April 18, 2015 at the Yuma Territorial Prison from 3pm to 7pm. We will have a live band and several beer vendors providing a wide variety of beer to taste test. It is always a good time and we look forward to seeing everyone there. We are working on two more small service projects to round out the year. With the help of our Yuma High Interact Club, we plan to paint the large scale USA map at two local elementary schools in town. We will also be awarding our scholarships soon, as our committee is hard at work to get the applications out to the local schools. Of course we will round out the year with our traditional Trip to Nowhere on June 12. Remember, we meet at Lutes Casino and go. WOW!!! Did we ever have a good time. We successfully completed our first fundraiser of the year. A huge thanks to Kortnee and all those that helped out at Pars Under the Stars. A big shout out to Burgers and Beer for providing us with a great dinner and the other companies and individuals for help on raffle prizes, equipment, and other things that made the tournament an evening to remember. The ball drop was a huge success. Congratulations to Tom Kelly for winning our grand prize of $2000. We sold over 1200 balls this year, proving once again that Fort Yuma Rotarians can get it done. It is a very exciting time moving toward the end of the year. The appetizer social is coming up where we will compete against other Rotary clubs for the honor of having the best appetizers in all of Yuma County. Our annual Christmas gathering will be on December 5th. We hope everyone will take some time to enjoy the company of other fellow Rotarians as we celebrate the holiday season. Our annual Christmas Shopping spree is coming up and Nora and her team are getting ready for another great way to give back to our community. I am proud to say that our Carver Elementary School project is on track thanks to Dan Tortolano and his great team. We are going to be demoing the area November 29th and preparing the site for the big weekend coming up on December 12-14. There is a lot going on for everyone to enjoy by putting "service above self" at this very important time of the year when we are thankful for what we have and grateful to help give back to our community and beyond. Thanks to everyone for everything that helps to make The Rotary Club of Fort Yuma the best Rotary Club anywhere. Penitentiary Pint Fest April 26th! 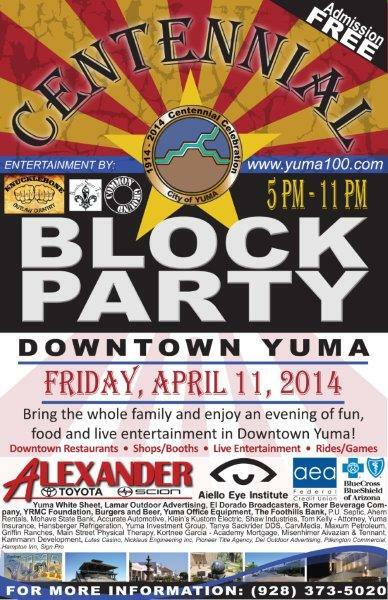 Centennial Block Party April 11th! PENITENTIARY PINT FEST REGISTRATION HERE! 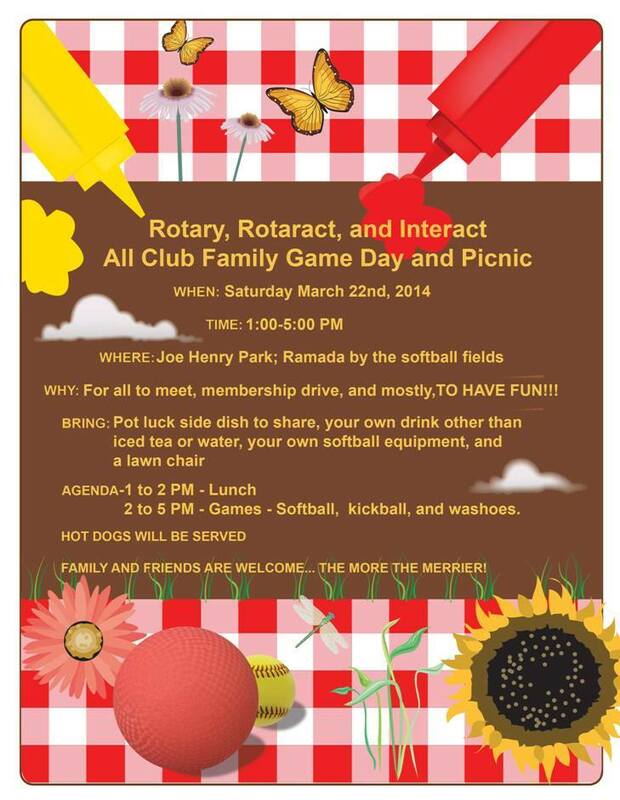 ALL CLUB FAMILY GAME DAY & PICNIC! 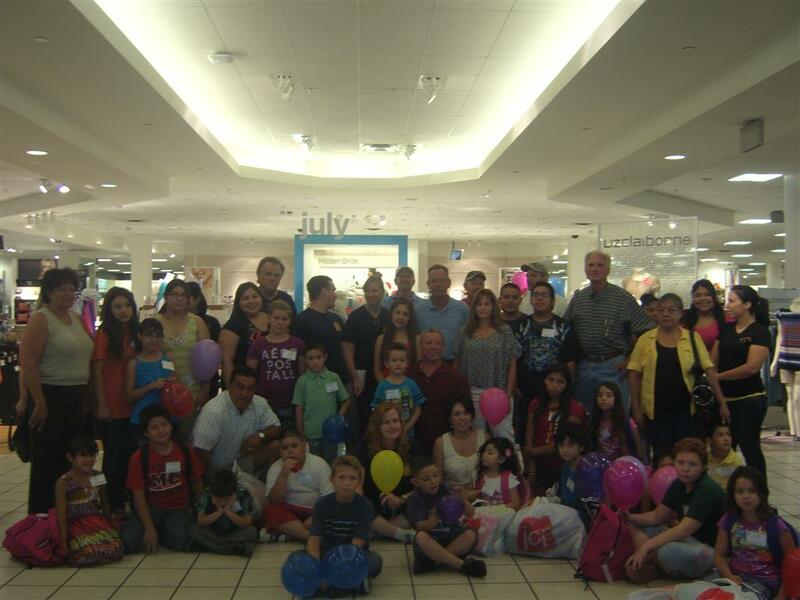 Fort Yuma Rotary Takes Students on Shopping Spree! Several students in need of supplies for the upcoming school year were taken on a shopping spree recently by members of Fort Yuma Rotary Club. Volunteers from the service organization and area high schools arrived at the JCPenney store at the Yuma Palms Mall at 7:30 a.m. last Saturday to take the 25 students on the Back to School Shopping Spree. JCPenney opened early to allow the kids time to shop, and provided each child with $100 for clothing and $25 for shoes. In addition, the Aiello Eye Institute provided backpacks filled with school supplies and Allure Hair Salon provided free hair cuts for all 25 children. Other companies who sponsored the event included Payless Shoes, 16th Street Dental Care, American Transmission, Don Peterson Engineering, Yuma Wellness Center, David Ellis and Associates, Mission Plumbing, Yuma Vision Center, Sam's Club, The Flower Mine and Klein's Kustom Electric. “By providing these kids with the supplies and clothing they may not have otherwise been able to afford, we are sending them to school well-prepared and confident,” said Fort Yuma Rotarian Marlene Aiello, chairwoman of the school shopping spree program. 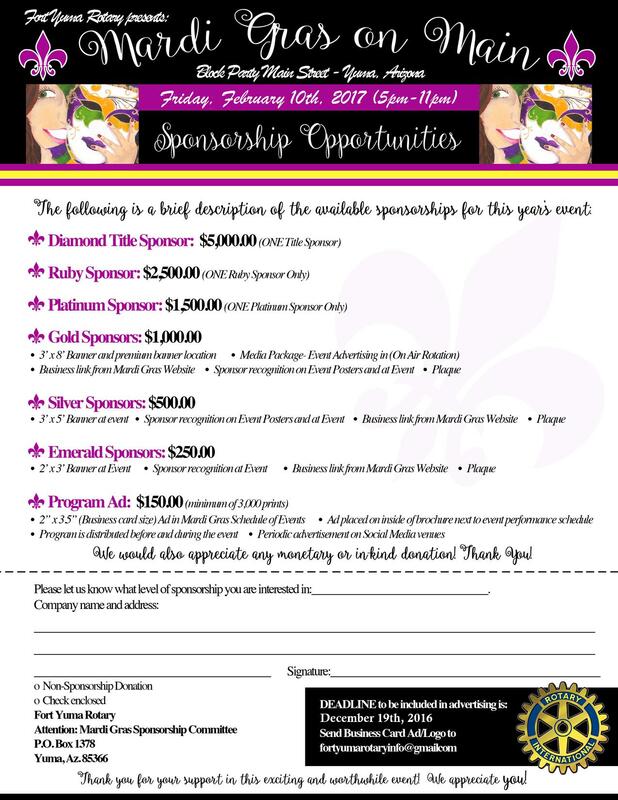 Funds for the shopping spree were raised through Fort Yuma Rotary's Mardi Gras Block Party and Pars Under the Stars Golf Tournament. “The Back to School Shopping Spree event was fun and rewarding for all involved,” said Cindy Landin, Fort Yuma Rotary Club community relations chairwoman. For more information about Fort Yuma Rotary Club, log onto www.clubrunner.ca/fortyuma/. Chris McDaniel can be reached at cmcdaniel@yumasun.com or 539-6849. Brad Sackrider graciously accepts two different contributions for his Sierra Leone trip. The board wanted to show their appreciation for Brad representing Fort Yuma on this Africa well project and gave him $1,000 to help with his expenses. Yuma High Interact also wanted to help Brad and be a part of this wonderful project and contributed $335 towards the trip. We are so proud of you Brad and can't wait for you to tell us all about your trip! Nancy Powell was honored at a recent Rotary meeting for being January's Rotarian of the Month. Nancy works tirelessly on keeping our financial books straight and has done so for the past three years. This job requires countless hours of behind the scenes work that many of us don't even realize goes on. Thank you Nancy for all you to for our club and congrats! Wow what a great month October proved to be for the Fort Yuma Rotary Club. As fast as it went by it did not go quick enough to leave this club in the dust. Ronna Stubbs Named September's Rotarian of the Month! Ronna Stubbs had the honor of being named Rotarian of the Month for September for her outstanding work on the Dateland School Backpack Program. Ronna wrote the grant for the project and organized the whole thing from the ground up. She also coordinates on a weekly basis with the Interact Clubs on getting them packed and making sure we have people to deliver them each week. Great job Ronna! After the district conference a couple of weeks ago, Keith and I wanted to take a peek at the Milagro playground in Tucson. Fort Yuma has spent the last two Saturdays "getting dirty" on our Old is Gold campaign. Jan and his crew spent the first Saturday scraping old paint and clearing the way for the paint crew to come back and paint the next Saturday. What a fine job we all did! The house looks great. There will be one more Saturday touch up day. If you can help, please let Jan know! 50/50 Pot Back to Zero! Well attendance has been great at Rotary lately. Fort Yuma's 8th Annual Pars Under the Stars was a huge success this year thanks to Robin and her committee. We have a fun and easy fundraiser set for November 15th at Brewers. Five Direct Sale Reps, three of who are Fort Yuma members, are donating 100% of their profits to the Polio Plus fund from November 15th-November 19th. Please take a look at the flyer located on the front page of our web site and consider doing a little of your Christmas shopping with these Reps to help eradicate polio. Recipes are coming in for our second edition cookbook but we still do not have enough yet. Please head to www.gandrpublishing.com and enter your favorite recipes. Contact Kelly to get the username and password. These do not have to be "your" recipes, just your favorites from other cookbooks or family members. . Don't get left out of this edition! December was a busy month for Fort Yuma and member Jack Frost. Jack has worked very, very hard this month on our Dateland concession stand. There could not be a more perfect guy for this project. Jack his given up much of his personal time to get this done and we are almost there! Congratulations Jack for being President Keith's December Rotarian of the Month. You deserve it! Yuma High Interact club, under the direction of Robin Eshbaugh, took tiime out of their Saturday recently to help Fort Yuma revamp the Mardi Gras signs. What a lucky club we are to have not just one but two great Interact clubs (Yuma High and Yuma Catholic). You'll never guess who won the $1,000 ball drop at our Pars Under the Stars Golf Event! Brad Sackrider who is a brand new Rotarian and has taken the Rotary motto "Service Above Self" seriously won the big money. What are the chances of that? About 1 in 765! For those of you who don't know yet, Brad has volunteered to go to Africa later this month to work on the water well project in Sierra Leone! Talking about jumping in to Rotary with both feet! Fort Yuma Rotary welcomes Erin Sitera from the Humane Society of Yuma to our club. Erin joined Rotary December 2, 2010 and is now part of the "Best Rotary Club in all of Yuma County". Robin Eshbaugh who works tirelessly with about 40 Interact kids at Yuma High every single week has earned the coveted "Rotarian of the Month" pin for the month of November. Her participation in the Old is Gold and our Dateland project also made her a stand out. Congrats Robin! Well we had so many Rotarians that stepped up in the month of October that President Keith had a hard time picking just one. So, as Presidents sometimes do, he broke the rules and picked three! Congratulations Jan S. for your work on our Old is Gold project, David C. for your hard work with our golf ball drop and Minda G. for working so hard at getting all the great raffle prizes for the Pars Under the Stars. Our club members rock! Welcome Marlene Aiello from the Aiello Eye Institute to Fort Yuma Rotary club (The Best Rotary Club in All of Yuma County)! Congrats are in order to our newest Paul Harris Fellow, Brad Sackrider! Way to go Brad! July's Rotarian of the Month! Congratulations Renee Dinwiddie for being President Keith's July Rotarian of the Month. Renee received this award for all of her hard work in organizing the Back to School Clothing Shop this year. Each Rotarian of the Month will be in the running to receive the prestigious Rotarian of the Year award that is given out at the annual Trip to Nowhere. Fort Yuma recently awarded Dr. Rick Geyer a check for $500 to go towards the Dictionary Project. Fort Yuma is passionate about literacy and this is something we have supported for many years. Recently we have added the Dateland school to the list of schools this project supports. Thanks Rick for all you do for the kids! Several Rotarians received their annual Perfect Attendance Awards at a recent meeting. Pictured here are the One Year Perfect Attendance recipients. Perfect attendance can be achieved by attending every club meeting, committee meetings, other club meetings and/or making up using the EClub online make ups. You can access the EClub from front page of our web site. Congratulations Rotarians! Mark Hansberger graciously receives his plaque stating that he is now officially part of "The Best Club in all of Yuma County". Thanks for all you do Mark! One of President Keith's first order of business on his first day as President was to recognize two individuals that have supported Fort Yuma Rotary for many, many years. Jack Puckett from Yuma Insurance and Mark Hansberger from Hansberger Refrigeration were made Honorary Members of Fort Yuma Rotary Club for their service to our club. Both Jack and Mark are members of Yuma Rotary but attend our clubs regularly and support us in our fundraisers. Thank you guys! This year, as our Dateland School service project, we are going to be rebuilding the shed that they use as their concession stand. Back to School Shop a Success! Fort Yumans got a chance to go shopping again this year. Well July has already flown by but we got this year started off with a bang. During his year as RI president, I often heard Bill Boyd express his passion for improving literacy. Let's Take a Rotary Cruise in 2008! 2008-2009 Rotry District 5500 Cruise With A Cause! What a great way to spread some happiness! Congratulations President Karen! Fort Yuma Rotary Club is the only Yuma area club to receive the award this year from the District Governor. Karen also acknowledged and gave kudos to the membership committee for their hard work and effort this past year. The Kids Have Come Home from RYLA, Hoorah! Are you ready for PUTS??? 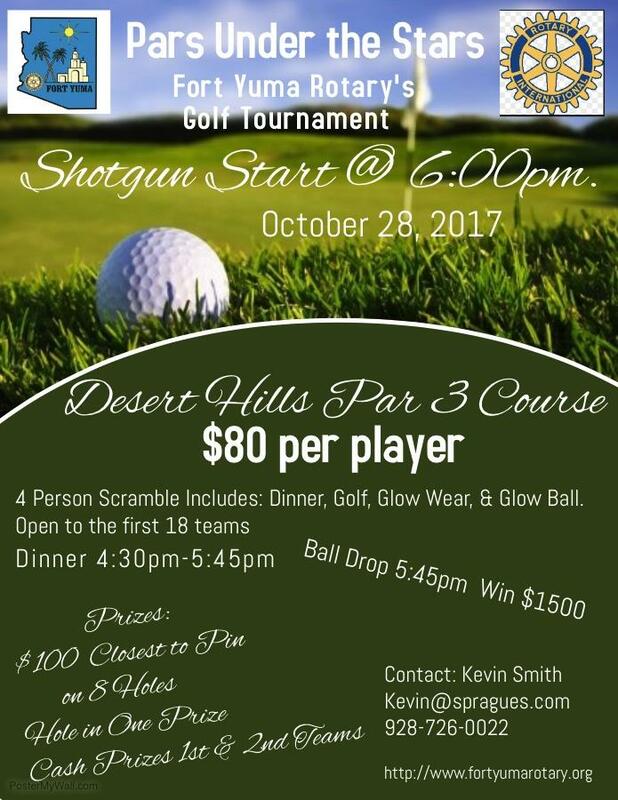 Fort Yuma Rotary is gearing up for our annual Pars Under the Stars (PUTS) golf tournament Saturday, November 2nd. This is one of our biggest fundraisers and helps our club give back to the Yuma community. It's glow in the dark golf. How fun is that? Please register to golf and/or buy golf balls for our golf ball drop where we will be giving away over $1,500 in cash! The flier for this event can be downloaded by going to our "download" section on the bottom right of this page and clicking on "2013 PUTS flier". President, Brad Sackrider, presented a check to Mike Ivers, Director of the Yuma Community Food Bank, for $2,000 today to help fund the backpack program. Fort Yuma Rotary helps support this program through monetary donations and helps with the delivery of backpacks to the Dateland Elementary school. The backpacks are filled with food and given to the children every Friday. Nice job Fort Yuma! Nora Bonillas was chosen by President Brad for July Rotarian of the month for her hard work on our first project of the year, the Back to School clothing shop. Way to go Nora! 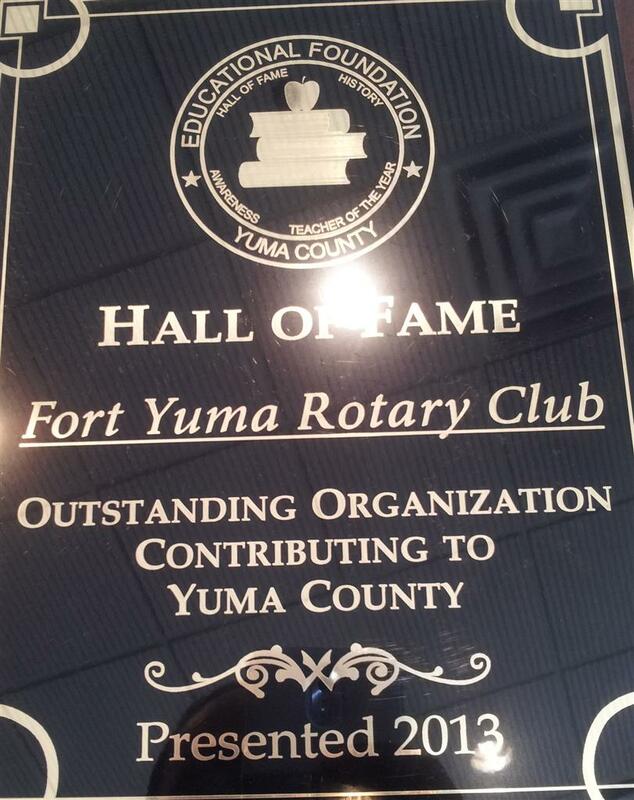 Fort Yuma - Educational Hall of Fame Award recipient!!! A group of local Rotarians spent a weekend in December working at Mohawk Valley Elementary School doing various repairs and additions to the campus that would have cost the school over $50,000 to do on their own. After spending fall meetings organizing work teams and doing prep work, more than 50 people from the Fort Yuma Rotary Club met for the three-day project to complete various projects on campus. “This project has been a godsend for our school,” said superintendent Doug Rutan, who explained that they currently do not have funds for campus or playground improvements. Rutan said that he was thrilled to be approached by the club about adopting Mohawk Valley School. They had previously adopted Dateland Elementary School as well. Fort Yuma Rotary to join Tournament of Roses Parade float New Year's Day! which was used to generate the Yuma Sun article. Enjoy! Once again, Fort Yuma Rotarians and several other sponsors were able to provide 25 fortunate kids with back to school supplies and clothing. Studies have shown that academic success is strongly linked to good health and a positive attitude. By providing these kids with the supplies and clothing they may not have otherwise been able to afford, we are sending them to school well prepared and confident. Beginning the school year with confidence can greatly affect motivation and provide a child with the enthusiasm he or she will need to persevere and adapt to the challenges of a new school year. First Fort Yuma New Member Orientation A Success! The inaugural Fort Yuma Rotary new member orientation meeting was held on March 15th. The meeting was held after work at Mohave State Bank. A great big welcome to our newest member, Janelle Johnson. Janelle joined the best Rotary Club in all of Yuma County January 19th and we are so lucky to have her! Janelle was proposed by Randy Nelson. Ask her about her family's BBQ sauce! Welcome Janelle! Marlene Campbell has reached her Paul Harris +1 status! Way to go Marlene and thank you for supporting The Rotary Foundation! Please welcome new member, Arturo Gomez! Arturo recently moved here from LA and chose our club to join after visiting other clubs in town! Good choice Arturo! We are lucky to have you! Fort Yuma Rotary Favorites 2nd Edition Cookbooks are here and they look great! We have already sold 200 of the books and have around 300 left to sell. Please make sure to help support this fundraiser and purchase some! We would like each member to sell 10 books each. They are stocked full of fabulous recipes from our members, family and friends. See Kelly to get your stack! Fort Yuma members recently updated our club picture with as many members as we could get in the picture. What a fine looking group of Rotarians we are! Now this is a guy who loves Rotary! Check out Brad's new Rotary wheel he made! That's awesome Brad! Fort Yuma's Pars Under the Stars A Success! Anyone who’s driven Interstate 8 toward California has seen the neat green rows of date palms. Some might have even stopped for a “date shake” in the small, unincorporated community of Dateland, about halfway between Gila Bend and Yuma. 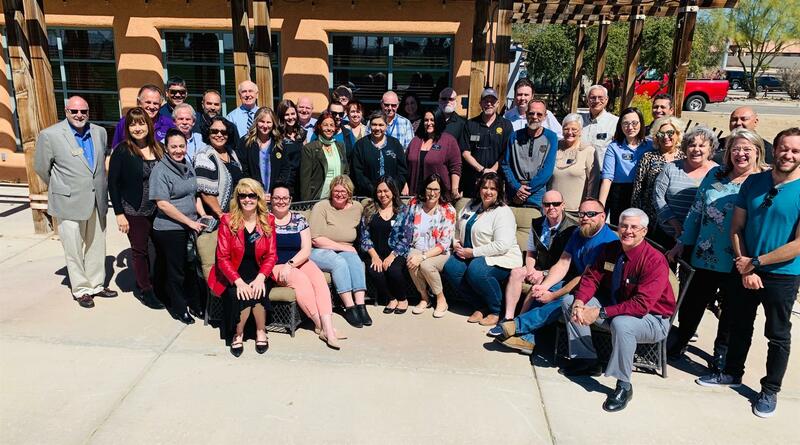 Who's Who in Fort Yuma Rotary? Meet your July Rotarian of the Month, Marlene Aiello. City of Yuma Fire Captain, Mike Landin, accepts a check for $2,000 from Fort Yuma Rotary’s President, Keith Boyd. The check is for the Yuma Child Burn Survivors and will allow children to attend the AZ Children’s Burn Camp, Camp Courage. Bob Rolle Joins the Ranks! Congratulations to Bob Rolle who became a Paul Harris Fellow recently. This man gives his heart and soul AND money to Rotary. We are so lucky to have him in Fort Yuma! Karen Ferguson has the honor of calling herself a Paul Harris Fellow now by contributing $1,000 to the Rotary Foundation. Nice job Karen! Kari Reily recently became one of Fort Yuma's newest Paul Harris member. Congratulations Kari! Dubia Zaragoza of Arizona's Children Association accepts a check for $2,000 from President Keith Boyd of Fort Yuma Rotary Club. Fort Yuma Rotary works hard at fundraising all year and is proud to help Arizona's Children and what they do for the Yuma community. Keith Boyd, Chairman for the 2012 Mardi Gras Festival, tries to get the club members jazzed up about the new format this year's Mardi Gras will take on. The Mardi Gras Festival will be an all day event this year on February 18th, 2012 rather than the evening block party it has been in the past. Look for more info to come! Fort Yuma Rotary President Keith Boyd presents Diane Umphress from Amberly’s Place a check for $1,000. With Yuma’s Unemployment rate one of the highest in the Nation the Yuma Community Food Bank has seen a consistent increase in families needing assistance. Fort Yuma Rotarians contribute to a successful school year! Thank you Fort Yuma Rotary for electing me as your new club president. Thanks, I think...just kidding. I am looking forward to the next 12 months. I’m sure the time will fly. Fort Yuma Rotary got another chance to help out their favorite school again. You have to wonder sometimes when you watch the news what is in store for this world. I personally get angry when I see other countries disrespect this great country we live in. It is easy to let hatred build inside when we see these things both on TV and even right here in Yuma. Jolynn and Dave recently shared their goals to raise money for this year's Golf-A-Thon with us. We really need every member to step up and take one dozen balls with them to either buy or sell to others. If everyone does their part, that would bring in $12,000 for the Golf-A-Thon! The price of the balls is one for $15, two for $25 and 10 for $100. There will be a $1,000 prize for the 1st in the hole, $100 for all other balls that drop in the hole and $100 for furthest from the hole! The balls will be dropped from a crane the night of the Golf-A-Thon. There just may be prizes awarded for who sells the most balls. Is it going to be Ted again? Come on Fort Yuma, let's do what we do best-raise money and have fun doing it! Fort Yuma has just inducted another member into the Paul Harris Society. President Keith and District Governor Ernie Montagne presented Clayton with his certificate last Thursday. You become a member of the Paul Harris Society when you pledge to give $1,000 per year to the Rotary Foundation. Thank you for your commitment, Clayton. You are a great Rotarian! Robin Hardee Rotarian of the Month! A big congratulations to Robin Hardee for being awarded Rotarian of the Month for August. Robin has been working her tail off lately helping Yuma Rotary with Bowlio and working hard on our upcoming Golf-A-Thon. Robin has been a Fort Yuma Rotarian since December of 1997. Robin is a worker. Everyone knows that when Robin is in charge of something, it will get done and it will get done right. More importantly than that, we know when she's in charge, it will be fun too! Congratulations Robin! Past President, Karen Griffin, will not get much of a reprieve from Rotary just yet. Karen changed things up for her last official meeting as President of Fort Yuma. Fort Yuma Rotary has worked to raise money and then passes it on to the community in various ways. In addition to the scholarships awarded to students that will be attending college, we have made a total of $5,000 of donations to the following organizations: Amberly's Place, Assistance League of Yuma, Burn Camp, Yuma Community Food Bank, Mason's Bicycle and Reading Project, Arizona Children's Assn., and United Way. Awesome! President Karen Griffin awarded Ted Brunner as the Rotarian of the Year. Ted will have possession and the honor of displaying the Fort Yuma Rotary Club Charter for the coming Rotary year. Great Job, Ted! Everyone gathered at Lute's Casino and waited for directions to the destination of "Nowhere". We were directed to the front door, cross Main Street and head south through the parking lot. There was the "Top of the Kress" building. We were served a dinner with a choice of prime rib or chicken. Pictures from the rotary year were displayed while we ate. President Karen acknowledged her board of directors, welcomed all the new members from this past year and summarized the events of the year with recognition of the committe chairmans (& co-chairs). President Elect Keith introduced his Board of Directors and Dave Hossler lead the installation. It has been another great year for Fort Yuma Rotary. Thank you to all our members! Jack Frost had put a presentation together featuring our Dateland School Project. Keith Boyd and Jack made the presentation during the Chamber of Commerce breakfast held today. Thank you to Jack and Keith and all the other members that attended early this morning. The presentation was also shared with the club during our meeting today. The next project with the Dateland School will involve the concession stand and a work weekend is planned for December 4th and 5th. Be sure to mark your calendar and plan to be there. Please welcome Patrick Deloney as a new member of Fort Yuma Rotary. He was inducted during our meeting on June 10th. His sponsor is Rob Campbell. Thank you Rob for being a sponsor! Patrick will be attending the Trip to Nowhere, a great opportunity to meet other members. Please welcome Brad Sackrider as a new member of Fort Yuma Rotary. He was inducted during our meeting on May 27th. His sponsor is John Bornt. Thank you John for being a sponsor! Brad has already shown enthusiasm for learning more about Rotary by attending the District Assembly held in Yuma this past Saturday. During May, we heard from Troy Love, LCSW, PHR (Courageous Journeys Counseling and Consulting Services, PC) and the GSE Team from Turkey informed us about their country and lifestyle. Please welcome Minda Greene as a new member of Fort Yuma Rotary. She was inducted during our meeting on April 29th. Her sponsor is Robin Hardee. Thank you Robin for being a sponsor! During April, our programs included Jack McArthur (Fire Chief for City of Yuma Fire Department, Juan Escamilla (US Census), Steve Grant (Sports World and Former NFL Player), Up with the People(Members from the Tour) and Steve and Beth (Yuma County Library). Thank you Dave Carvell for taking care of the programs portion of the meetings for April. During March, our programs included Allison Miller (KSWT Meteorologist), Doug Rodstrom (SW Arizona Human Resource), Mardi Gras Committee (Sponsors & Art Students) and Christoper Belin (Travels in South Africa). Thank you Dave Carvell for taking care of the programs portion of the meetings for March. Delivering Flowers for Valentine's Day! It was a gorgeous evening on Main Street for the Mardi Gras party. One of the new ideas added this year involved the local school art programs. Students were asked to submit art for a contest choosing the art logo to be used in advertising the Mardi Gras. T-shirts were also printed and sold using the winner's art. The art pieces entered in the contest were displayed on Main Street during the Mardi Gras event. Thank you for everyone's involvement and hard work to make this event a success! Fort Yuma Rotary sponsored local youth to attend the Rotary Youth Leadersip Awards held at Chapel Rock on January 15, 16, 17, & 18. Dave Carvell & Everett Lacy, members from our club, were among the many counselors involved in the weekend. Some of the students who attended from Yuma were present during our February 18th meeting to share their experience at RYLA. During January, we heard from Judy Gresser (Yuma Community Foundation), Marc Nigliazzo (President of AWC) and Dr. Barrows (New Technology in the Dental Field). Thank you Tom Rush for taking care of the programs portion of the meetings for January. We also had a special guest during the month of January, District Governor Elect (DGE) Ernie Montagne and his wife, Sally, visiting from Sierra Vista. Fort Yumans! You have a chance to own the beautiful artwork that won our Mardi Gras logo contest by artist, Vanessa Iturbide. Email Karen at griffinym@aol.com if you would like to place a bid on this piece! Proceeds will go towards an art scholarship for Vanessa! Check the web site daily for updates on the current bid. Please welcome Jeanne Vatterott-Grogan as a new member of Fort Yuma Rotary. She was inducted during our meeting on January 7th. Her sponsor is Dave Hossler. Thank you Dave for being a sponsor! Jeanne is the advisor for the Yuma Catholic Interact Club. During December, John Larkin (Historical Actor) performed a skit with Dan as his co-star; Terry Pray and Vince told us about CASA (Court Appointed Special Advocate) and Tanya Hodges regarding (University of Arizona). No meetings were held on December 24th and 31st. Thank you Tom Rush for taking care of the programs portion of the meetings for December. During November, we heard from Andrea Bereznak (Experience as an Ambassadorial Scholar), Gary Whiting (Gift of Life/Arizona, Inc.) and Darwin Stiffler (Yuma Elem. School Dist. #1). Thank you Tom Rush for taking care of the programs portion of the meetings for November. Craig Crossland drew the right card to win the pot of money accumulated from the weekly card draw. A new deck of cards will be started for the January 7 drawing. Welcome New Members, Chandra & Jason! Please greet our two newest members of Fort Yuma Rotary and welcome them to our club. Chandra Olaque was sponsored by Ronna Stubbs and Jason Kukuk was sponsored by Jaime Honold. Thank you to Ronna and Jaime for being sponsors. Paul Harris Fellows: Jolynn P. and Dave C.
President Karen has the honor of presenting Jolynn Pangerl and Dave Carvell with their Paul Harris awards. Welcome New Members, Debra and Dubia! Debra Green (sponsored by Everett Lacy) and Dubia Zaragoza (sponsored by Renee Dinwiddie) joined Ft. Yuma Rotary as our newest members during our meeting today. Please welcome them to the club. Thank you Renee and Everett for being a sponsor of a new member. During the month of October, President Karen installed three new members: Beth, Debra and Dubia. Speakers for the month of October were Greg Stopka (Yuma Community Poverty Simulation), Yuma Co. Main Library (Tour of New Library), Nancy Patterson (Nutrition & Fitness) and Dubia Zaragoza (Arizona Children's Association). Golf after dark? Fort Yuma Rotarians held their version of a golf game on September 26th with the event named "Pars Under the Stars". The evening started with grilled hamburgers and hotdogs with a pot luck of side dishes and desserts. Purchased golf balls were dropped from a lift high above the hole and the owner of the lucky golf ball to land in the hole won the prize of $1,000. Please welcome Beth Martinez as a new member of Fort Yuma Rotary. She was inducted during our meeting on October 1st. Her sponsor is K.C. Hoffman. Thank you K.C. for being a sponsor! Fort Yuma Now Controlling Population? That's right! Fort Yuma was at the spay and neutering clinic bright and early last Saturday morning. Membership Committee on a Roll! Fort Yuma membership is growing by leaps and bounds. Several of us had the pleasure recently of delivering school supplies to the Dateland school. During September, we heard from the Yuma County Humane Society (Spay and Neuter Program), District Governor Steve DiMuzio and Venture Crew #8051. Thank you Jolynn for taking care of the programs portion of the meetings for August and September. District Governor Steve DiMuzio visited our club and was the speaker for our meeting on September 10th. He also presented Tammy, Kyle, Joe, Jack, Nancy, Sue and Ted with their Paul Harris Fellow recognition. Thank you to all of you for supporting the Rotary Foundation. Eric Capetillo was installed by President Karen during our meeting on September 24, 2009. Please extend a welcome to him the next time you see him. Thank you Ted for being a sponsor. Please welcome Sarah Determan as a new member of Fort Yuma Rotary. She was inducted during our meeting on September 3rd. Her sponsor is Cindy Landin. Thank you Cindy for being a sponsor! Please welcome Randy Candler as a new Fort Yuma Rotarian. He was installed as a new member on August 27, 2009. Thank you Kevin for sponsoring Randy. Please welcome Randy Nelson as a new member to Fort Yuma Rotary. Thank you Ronna for sponsoring Randy! President Karen had a larger than usual group for her first meeting presiding as Club President. Evelyn Malo (sponsored by Dan Montoya) and Jaime Honold (sponsored by KC Hoffman) join Ft. Yuma Rotary as our newest members. Please welcome them to the club. Mark Watson, Assistant District Governor 2009-2010, performed the installation of the 2009-2010 Fort Yuma Officers and Directors. Robin Finn, sponsor for Karen Griffin, presented Karen with the President's pin and Karen had pins for the officers and directors of the board. Congratulations! Keith and Kelly Boyd were presented with a crystal and a diamond pin for each of them in recognition for their donations to the Rotary Foundation. Thank you for your support of what Rotary does for the local communities and around the world. The team leader, Rotarian Graham Todd, accompanied by four professional women came to visit District 5500 and take part in a group study exchange. The four professional women on the team are Tracey Crommelin (marketing management), Zulfa Petersen (journalist), Joline Nel (accounting), and Wendy Van Schalkwyk (operations & account director). All of the team are from Cape Town and did not previously know each other. Jack Puckett from Yuma Insurance, 2009 Major Sponsor of the Fort Yuma Rotary Mardi Gras. The Board of Directors welcomes Renee Dinwiddie as our newest board member. The drawing for the winner of the airboat was held during the evening festivities of Mardi Gras. The Yuma High Interact joined in the fun with their club members willing to take a pie in the face to earn some money. The weather was beautiful all day and evening. Several members gathered at the Karen's home to lend a hand in preparatory work needed for the jambalaya and beignet dough. We gathered at the Landin residence for a festive evening to share fellowship and fabulous food. We all enjoyed the cool evening with a little warmth from gas heaters, firepits and beverages. There was an ornament exchange after dinner. Thank you to the Mike and Cindy for opening their home to us and the committee for organizing a fun time! Help Fight Polio With Cell Phone! 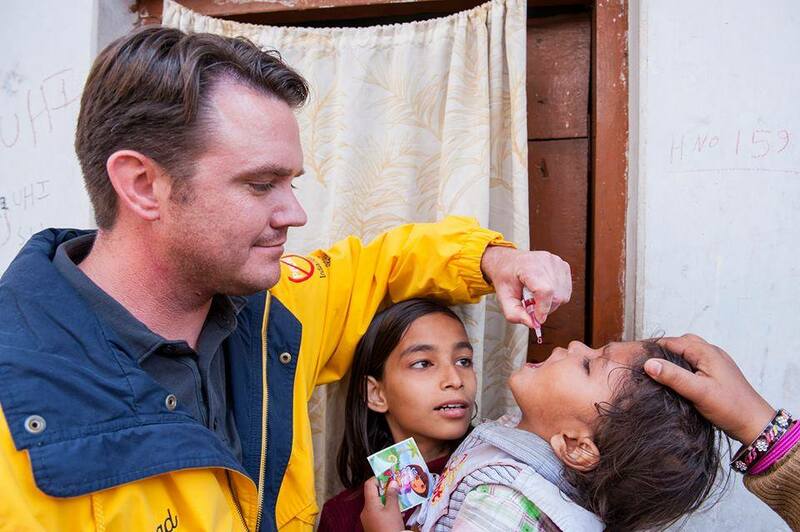 Donate US$5 to polio via text message! February is World Understanding Month! you a question. "Why are you a Rotarian?" Club elections were held and congratulations are in order! Fort Yuma Does it Again! Cindy Landin and her awesome committee once again succeeded in scoring Fort Yuma two awards recently at the annual Appetizer Event. Fort Yuma won for Best Generic and (of course) Best Presentation for our Greek theme. Thanks again Cindy for, once again, putting your all in to every project you do! Recently two schools in Ensenada, Mexico were visited by tons of Rotarians from District 5500. After several hours of driving we finally reached the Grand Canyon National Park. The lucky ticket number for the week was held by Shawn Ringwald. And then Shawn drew the lucky card, collecting $1600 plus. Fort Yuma has been given the wonderful opportunity to raise money by being given an air boat to raffle off! Rob Campbell, President of Fort Yuma Rotary, proudly presented a check for $500 to District Governor Tom Tilton and wife, Maria, when he made his official visit to Yuma recently. Fort Yuma's Newest Paul Harris Fellows! Recently Fort Yuma had the privilege of honoring five members with Paul Harris Fellows. Ronna Sue presents Keith Boyd with a framing of memorabilia from Marian Bigras, spouse of former Honorary Member Real Bigras. Real regularly attended our club meetings during the winter months as a visiting Rotarian from Canada. Real felt at home attending Fort Yuma meetings and working at Fort Yuma events. Real lost his battle with cancer last year. He is fondly remembered by all those who knew him. President Rob welcomed new member, Lisa Nelson, during our meeting on July 17th. Lisa was born in London England. While living in Europe, she worked in the travel industry. In 1996, Lisa ventured to the USA, has lived in North Carolina, Virginia and finally to Yuma in 2003. She has worked at the YMCA for five years and currently is Membership/Health & Wellness Director. Robin Finn recently returned from Prescott, Arizona where she had the awesome privilege of being a Counselor at Camp Courage. Debra Hunter, Marketing Manager for Yuma Habitat for Humanity, excepts a check for $3000 from Fort Yuma President Ronna Sue. Lucky Yuma Teens Get Help for College! These lucky teens, or should I say their parents, will get a little help from Fort Yuma in furthering their education. Cullum Smith put his 50/50 winnings to good use recently. The end of the year is upon us and all of Fort Yuma's hard work is finally paying off. Recently we were honored to add Liz Greiner and Jeanne Hollis to the growing list of Fort Yuma Rotarians. The GSE Team from Rotary District 2530, Fukushima, Japan made a stop in Yuma this week, and made a presentation to Fort Yuma. The Harlem Ambassador basketball team recently came to town to take on Yuma's finest (pictured here) for a fundraising event. Cullum Smith was the lucky winner in the card drawing and takes home over $4700! Mardi Gras chairman Cullum Smith and Lori Vandersloot pose as the 2008 Fort Yuma Mardi Gras gets underway. Jim Hewlett, BOCO, CFO, and newly elected by the certificants of the Board for Orthotist/Prosthetist Certification (BOC) to their Board of Directors, submitted a personal account of his participation in a very recent humanitarian effort. President Ronna presents our favorite server Mona, with a Christmas bonus. Robin and Rocko huddle for warmth in front of Wal Mart on Ave B last Thursday. Keith Boyd happily selects the right size for his shopping partner. Fort Yuma Rotarian Jack Frost directs members to various tasks at the recent Habitat for Humanity Frame-A-Thon. As a result of a tie in voting, a coin was tossed to determine the 09-10 Fort Yuma Rotary President. Golf A Thon a Great Success! The annual Golf A Thon went off without a hitch. Russell McClouds team didn't win but had as much fun as any. Do you feel a need to help with the devastating fires in southern California, but you don't know where to turn? Russell McCloud recently honored his mother Mary, with a Paul Harris Fellow. Xanthi Panos is presented with her certificate, designating her a Paul Harris Fellow, by PRID Dave Hossler. Alan Jorgensen accepts his membership certificate from President Ronna. School Classroom Project in Congo in Full Swing. Former Fort Yuma Rotary member Melody Dunn accepts her certificate of her Paul Harris Fellowship. Leslie accepts her President's Gift from new President Ronna Sue Stubbs. Ron Boutwell is welcomed as the newest member of Fort Yuma Rotary! The Emperor of story book fame had nothing on almost 50 local children on July 28th, when members of Fort Yuma Rotary took them on a whirlwind spree through Mervyn's to purchase them each more than one hundred dollars worth of new clothes. Rotary was the focus at a recent Yuma Scorpions Baseball game, when the local minor league baseball club made it Rotary Night. Want to advertise your business on our site? We are selling spots to advertise your business on our Fort Yuma site. What a great way to get your name out there and remind club members what you do! For only $100 per year you can have a link on our web site to your business. Contact Kelly for more info!